Find hotel near Madonna Del Ghisallo Or M .. The Blessed Virgin Mary gets around – this is the site of yet another of her apparitions. Essentially a hill with spectacular views, the place has a story that goes like so: the medieval count Ghillaso was saved from robbers by her apparition. Today, cycling races are held at this spot, which led to local priest Ermelindo Vigano to suggest the apparition be made the patroness of cyclists. This has been approved by the Pope. Hence, the shrine here also contains a small cycling museum; also, an eternal flame burns here to commemorate cyclists who have died. 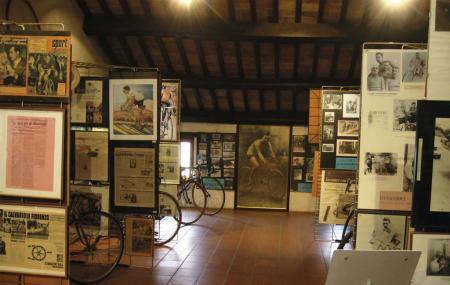 Famous in the collection here is the crumpled cycle of Fabio Casartelli – a renowned cyclist who died on this very bike. There is also a 1947 Bianchi, thought to be the first aluminum racing cycle ever made. How popular is Madonna Del Ghisallo Or Museo Del Cyclismo? People normally club together Bellagio Water Limousines and Lido Di Bellagio while planning their visit to Madonna Del Ghisallo Or Museo Del Cyclismo. Very popular sanctuary for cyclists. Go inside, it's steeped in rich cycling history. Some great statues outside as well. There's parking and the cycling museum close by. A church dedicated to the cyclism!... cool! I am so happy to find out the name and location of this wonderful sanctuary to cycling. About 15 years ago I found this completely by accident while solo cycling into Belaggio. I went inside and almost fell to my knees. It is packed with old bikes and jersies. At the time it had Fabio Castellas (sp?) jersey...a local bike hero who had just been killed in the Tour De France. This is heaven for cycling...and the sanctuary is something special.